Earth First! Road Show & Direct Action Camp! RADAR and Wild Idaho Rising Tide (WIRT) are grateful to co-host the 2017 Earth First! 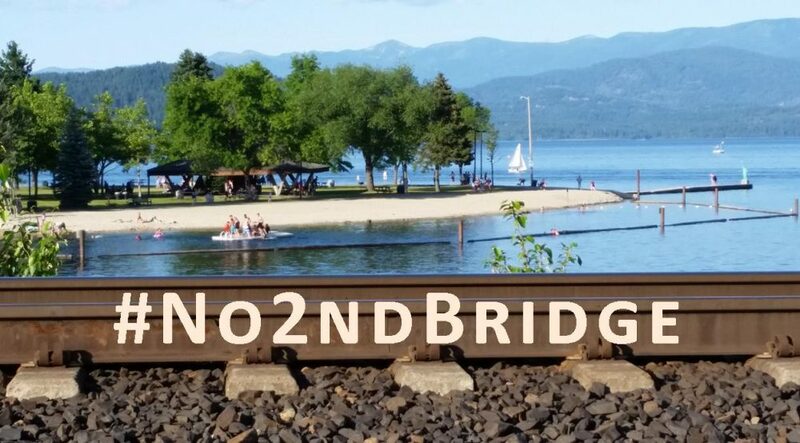 Road Show and Direct Action Camp on Thursday and Friday, June 22 and 23 in Sandpoint, Idaho ! Activists are converging for a camp over several nights, training sessions from 9 am to 5 pm on Friday, and a gathering starting at 6 pm on Friday, at several locations disclosed by RSVPing to WIRT. To connect with, learn about, and support the various ecological and social resistance struggles for a better world, a group of Earth First!ers has been offering skills sharing workshops for rabble rousers, water protectors, land defenders, anti-fascists, and other instigators of a wild revolution, since late April 2017 . On a two-month, cross-continent tour beginning in south Florida and ending at the annual, July 2 to 9 Round River Rendezvous, this year in northern California, the road show collective has been nurturing the inspiring seeds of dissidence throughout the country, along a route that coincides with action camps and conferences. A day of workshops adapted to participants’ interests will provide a one-hour talk about Earth First! history, stories, and philosophies, and a short presentation promoting biocentrism within a cross-struggle framework, all addressing the current U.S. political climate. Over 25 hours of skill share offerings, from which people attending can choose, could possibly include two levels of direct action training and topics such as security culture and community, digital security, knowing your rights, scouting, ground games, strategizing, safety and self-defense, countering urban and rural police tactics, de-arresting, resisting grand juries, short- and long-term jail solidarity, and live action role playing. We welcome your request for the descriptive list of potential training sessions, in advance of these workshops. Please consider donating, if you can, directly to the Earth First! Road Show collective for gas money, through the following links, with a note specifying the road show, and to WIRT for venue and meal expenses. For tour updates, questions, and comments, visit the EarthFirstRoadshow17.WordPress.com website, and email the road show crew at earthfirstroadshow2017@riseup.net. See WildIdahoRisingTide.org and contact WIRT by phone, text, and email message, for further event information, materials, suggestions, and RSVPs. The road show collective has asked for training camp promotion in person and via email, listservs, and flyers, keeping necessary event logistics, guest lists, and outreach private through facebook. Please print and post the attached, letter-sized, color, PDF version of the Earth First! 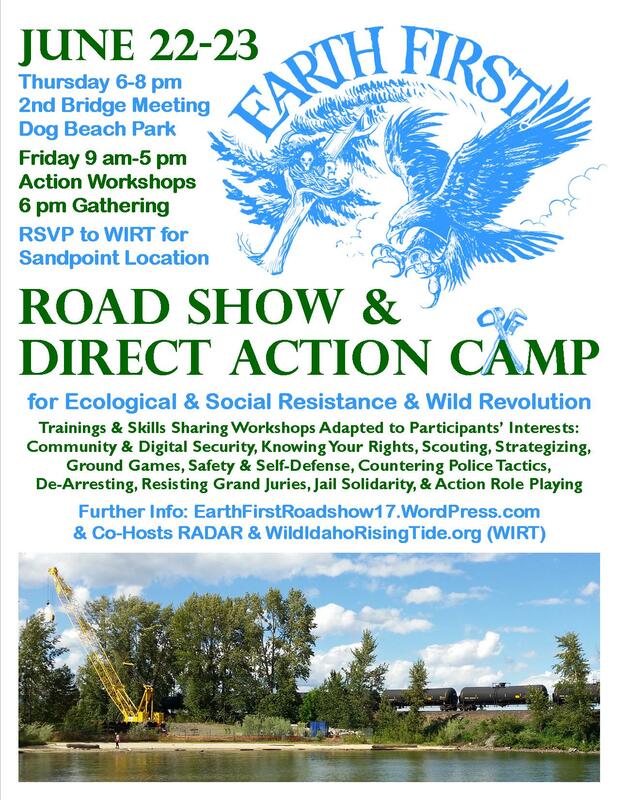 Road Show & Direct Action Camp Flyer 2, and join us on June 22 and 23 in Sandpoint! Thanks!